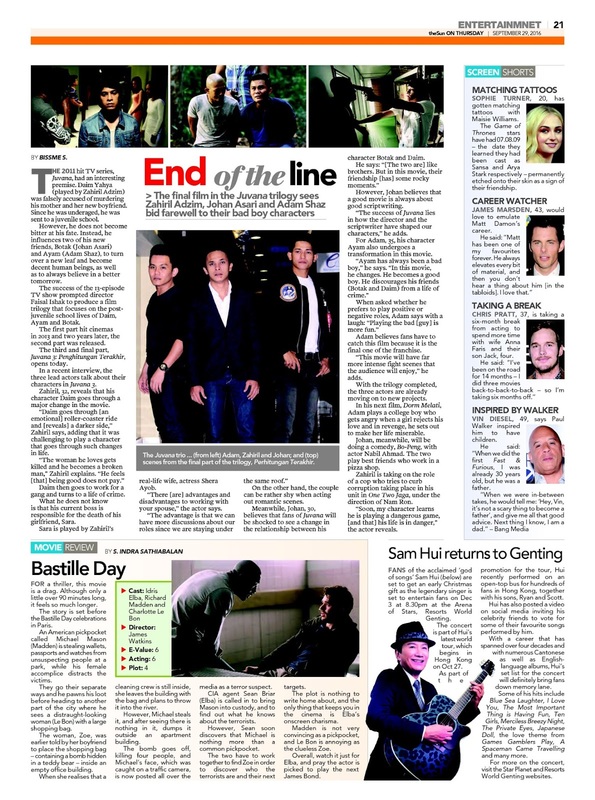 theSun spoke the cast from the film Juvana and here is the full story. The 2011 hit TV series, Juvana, had an interesting premise. Daim Yahya (played by Zahiril Adzim) was falsely accused of murdering his mother and her new boyfriend. Since he was underaged, he was sent to a juvenile school. However, he does not become bitter at his fate. Instead, he influences two of his new friends, Botak (Johan Asari) and Ayam (Adam Shaz), to turn over a new leaf and become decent human beings, as well as to always believe in a better tomorrow. The success of the 13-episode TV show prompted director Faisal Ishak to produce a film trilogy that focuses on the post juvenile school lives of Daim, Ayam and Botak. The first part hit cinemas in 2013 and two years later, the second part was released. The third and final part, Juvana 3: Penghitungan Terakhir, opens today. In a recent interview, the three lead actors talk about their characters in Juvana 3. Zahiril, 32, reveals that his character Daim goes through a major change in the movie. “Daim goes through [an emotional] roller-coaster ride and [reveals] a darker side,” Zahiril says, adding that it was challenging to play a character that goes through such changes in life. “The woman he loves gets killed and he becomes a broken man,” Zahiril explains. real-life wife, actress Shera Ayob. “There [are] advantages and disadvantages to working with your spouse,” the actor says. On the other hand, the couple can be rather shy when acting out romantic scenes. Meanwhile, Johan, 30, believes that fans of Juvana will be shocked to see a change in the relationship between his character Botak and Daim. However, Johan believes that a good movie is always about good scriptwriting. “The success of Juvana lies in how the director and the scriptwriter have shaped our characters,” he adds. For Adam, 35, his character Ayam also undergoes a transformation in this movie. “Ayam has always been a bad boy,” he says. “In this movie, he changes. He becomes a good boy. He discourages his friends (Botak and Daim) from a life of crime.” When asked whether he prefers to play positive or negative roles, Adam says with a laugh: “Playing the bad [guy] is more fun.” Adam believes fans have to catch this film because it is the final one of the franchise. “This movie will have far more intense fight scenes that the audience will enjoy,” he adds. With the trilogy completed, the three actors are already moving on to new projects. In his next film, Dorm Melati, Adam plays a college boy who gets angry when a girl rejects his love and in revenge, he sets out to make her life miserable. Johan, meanwhile, will be doing a comedy, Bo-Peng, with actor Nabil Ahmad. The two play best friends who work in a pizza shop. Zahiril is taking on the role of a cop who tries to curb corruption taking place in his unit in One Two Jaga, under the direction of Nam Ron. “Soon, my character learns he is playing a dangerous game, [and that] his life is in danger,” the actor reveals.